This article is 3112 days old. The Global Day for Action on Climate Change didn’t just pass by in Windsor. The Windsor On Watch TOXIC TOUR took a group of around thirty environmentally concerned people on a trip (via a Transit Windsor hybrid bus) to a number of notorious pollution sites in west Windsor. 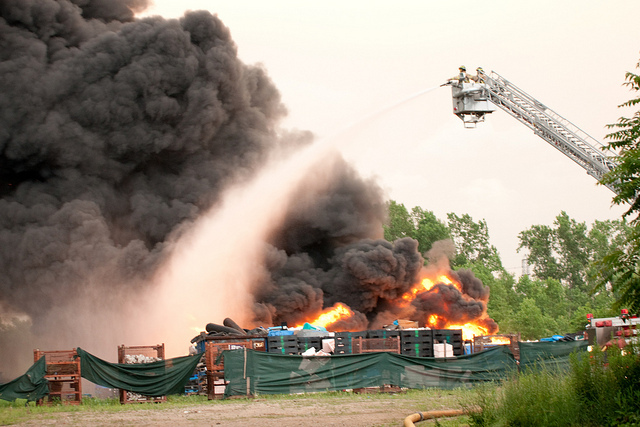 Speaking about June’s major plastics fire in the west-end, Suzy Myskow, organizer of the Toxic Tour recalled, “The firemen said [to me] they couldn’t even put it out because the smoke that would be generated would be worse than if they just let it burn out…and it was highly carcinogenic”. “We chose to do just the N9C postal code,” said Myskow, who planned and led the tour. Windsor On Watch made use of Scorecard.org, the US’s Environmental Protection Agency’s Toxic Release Inventory and 350.org to discover what types of pollutants were being expelled from nearby factories. Windsor On Watch will be launching their blog soon at http://windsoronwatch.wordpress.com and will have pictures from the Toxic Tour up shortly.